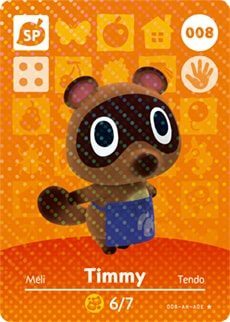 Young raccoon Timmy is a savvy businessman, running ramshackle shop Nookling Junction on Main Street in Animal Crossing: New Leaf. With help from his brother Tommy, as the player does more business in the shop they will steadily upgrade it until it grows into a three-story mega shopping centre. His birthday falls on June 7th, meaning that his star sign is Gemini.